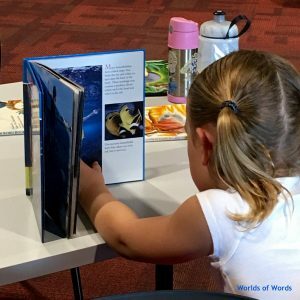 WOW Stories: Connections from the Classroom is the refereed journal of Worlds of Words, an initiative dedicated to creating an international network of people who share the vision of bringing books and children together, thereby opening windows on the world. We publish 1-2 issues a year that contain individual manuscripts and 1-2 issues a year that are submitted by a specific literacy community. • Describe classroom or library practice (K-12) that connects children and literature in ways that promote intercultural understanding or that involves working with educators or university students around literature to build intercultural understanding. Include student voices where appropriate through quotes of student talk, examples of student work, audio clips, or video clips. • Include charts, graphs, student artifacts, bulleted points and/or figures wherever possible to vary the format and enhance the content of the article. • Be between 2000-2500 words. • These manuscripts will be sent out for review by our editorial board, with decisions made within four months. • Browse examples of individual manuscripts included in WOW Stories. Individual manuscript deadlines are June 15, 2019 and January 15, 2020. • A group of educators from a school, library, project, writing group or university course can submit a proposal to put together an issue of the journal. • Determine a theme/topic from the community’s work together related to using multicultural or global literature with students to create intercultural understanding. • Submit a 2-3 page proposal that describes the topic and provides a schedule for developing the vignettes along with the names of the authors who will contribute and the name of the contact person. • Issue begins with a short introduction of the focus for the issue and introduces the literacy community. • Issue contains 5 or more vignettes around the theme. • Browse examples of community-based issues of WOW Stories. Issue proposals are accepted at any time. Submit your manuscript now using our online form. For specific questions or inquiries about WOW Stories, contact the editors, Tracy Smiles, at trcysmls@yahoo.com, or Mary Fahrenbruck, at fahrenbruckm@gmail.com. Do not submit your manuscript to WOW Stories: Connections from the Classroom if it is under consideration for a different journal or publication. Your manuscript must represent original work and cannot have been published previously. Manuscripts sent to the Editorial Review Board will undergo blind review. To facilitate this process, names of the authors should not appear in the body of the manuscript or in any headings or citations. The title page with author contact information should be emailed in a separate file from the body of the manuscript. If there is more than one author, the title page should indicate who the main contact person is. The review process will take up to two months. Manuscripts should be in APA style. Please check your references to make sure they are formatted correctly. While the language of WOW Stories: Connections from the Classroom is English, we encourage authors to include student voices in the language used during the learning engagement. However, please provide translations whenever possible. In written dialogue the translation should go in brackets immediately after the home language. If you are including student voices in a language other than English through a video, audio file or podcast, please provide subtitles or an English translation. If this is not possible, integrate an English-language summary into the manuscript so that the reader understands why the video or audio was included in the manuscript. We encourage the use of figures, tables, images, and multimedia that enhance the content of the article and take advantage of the journal’s electronic format. While your manuscript is undergoing review, these should be integrated into the manuscript and may be lower quality for quick downloading by reviewers. Provide web-quality images and media. Images that are not web-quality will not be published. Images should not be sent as Word documents. Graphics should be either in GIF or JPEG format. All tables should be formatted using the Table tool (versus using tabs). If your image was generated in Word (such as a table or chart), it can be saved as a PDF by going to print it but using the PDF option instead. If it is an image placed in Word, then the image needs to be right clicked on and saved as a JPEG. For video files over 8MB, authors may be asked to submit a CD or jump drive rather than sending it electronically. An audio file submitted for consideration for publication should be in complete and final format. Any editing of the audio file will be the responsibility of the author. We accept files in MP3 or iTunes format. We require consent-to-publish forms from each author. Use the WOW Stories form and have each student and/or parent complete and sign the forms. Copy the informed consent forms that you used when you did the research or classroom engagement and send those forms to the editor. If you choose this option, be aware that your students will no longer be anonymous since the editor will have access to their real names. Write a blanket letter of consent stating that you have those forms in hand but are not sharing them to maintain the privacy of the students. If this is the case, you need to provide a blank copy of your permission form with your letter. This must be the sole purpose of your letter—don’t include other issues regarding your article in the content of the letter. Mail the blanket letter of consent and the blank copy of your permission form to the editor. If your manuscript is accepted for publication, the authors must submit consent-to-publish forms, professional affiliation forms, and student consent forms along with the manuscript and related files in the electronic format as required. If paperwork or electronic files are not completed the manuscript will not be published.